Park Avenue. 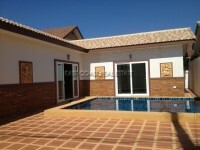 This 2 storey house is situated in a quiet village located in East Pattaya, close to Highway 36, Laem Chabang, international schools, hospital, etc. North Pattaya is only a short drive away. The house is sat on 80 wah² plot of land and consists of 4 bedrooms, 4 bathrooms. It is sold partially furnished but includes 4 A/C units. Title deed is held under Thai name ownership with taxes and transfer fees split 50/50 between both parties.